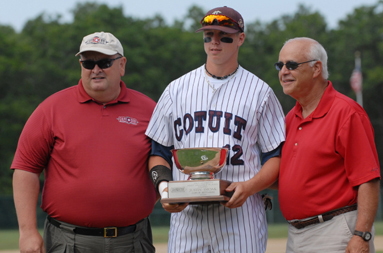 Justin Smoak of the Cotuit Kettleers and the University of South Carolina has been named MVP of the Cape League for the summer of 2006. Although there were several worthy candidates, Smoak posted by far the most impressive offensive numbers in the league. Smoak, who will be a sophomore at USC this fall, felt honored to win the award and even to participate in the league. Cotuit general manager Bruce Murphy loved his first baseman, saying that it’s players like Smoak who keep the great volunteers that the league is so privileged to have hard at work each day. The 2007 season seems far away at this point, but Cotuit fans can surely get excited about the prospect of having the league’s best player in 2006 return to Lowell Park next June.